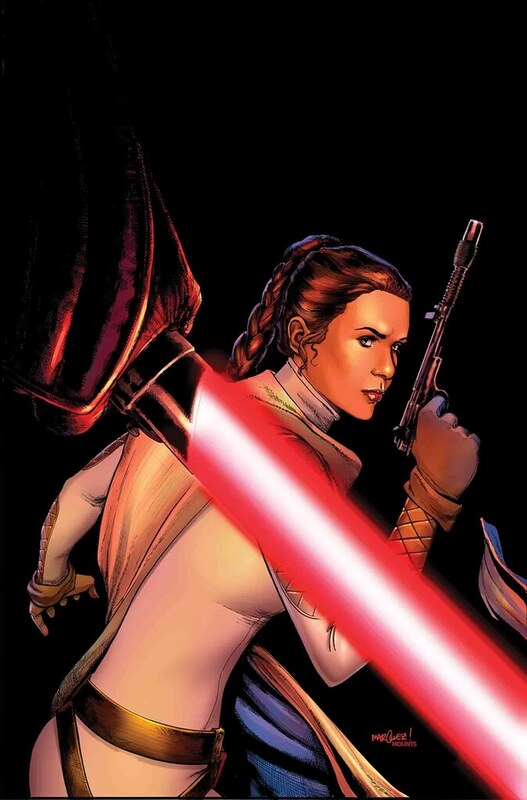 Star Wars #54 continues the battle between the Rebels and Vader as all hope comes down to Leia and her team. After infiltrating Vader’s flagship, they just need to obtain the override codes and return to their fleet. The question is, who will survive the mission? As expected, Leia succeeds in getting the override codes, despite having to just jump over across a battlefield and infiltrate a Super Star Destroyer. But they do it spur of the moment and they’re successful. They hangup is there is only one TIE fighter to escape on, so Leia is the only one who gets to leave. Say goodbye to General Draven. While we didn’t really have any reason to like him in Rogue One, his send off in the comic isn’t too bad. Leia manages to return safely to the Rebel fleet through blind luck and convenience since she’s flying in a TIE fighter and can’t talk to anyone. With the codes, the Rebel cruiser is able to escape. But I guess they left some ships behind? To be honest, the story is alright. At this point it feels like it’s getting dragged out. I’m a bit bored of this whole fleet battle, as it just doesn’t feel like there’s any genuine stakes involved. There’s no new characters we’re invested in who’s lives are in danger. The Rebel’s escape isn’t anything all that exciting. Plus, there’s a lot of gray area with just how many Rebel ships are left, and why they didn’t bother transmitting the escape codes before they jumped for hyperspace. They end the issue like they’re going to go back to the battle to help everyone else. It just seems clunky and contrived. The artwork is one of the better parts of this issue. Salvador Larroca does a great job with the visuals, knocking out great images for the characters, the ships and the action. From the line work, to the arrangements, colors and lighting, it all looks great. Overall, it’s an okay issue, but I’m ready for the story to move on. As is, I give this one a three out of five metal bikinis.